Amiran Kenya, one of the industries leaders in Floriculture, Horticulture & Agriculture, has signed up to support the 2019 Kenyan National Rally Raid Championship. This marketing partnership will come into effect from the opening round of the 2019 championship which is scheduled to take place in Naivasha in early March. 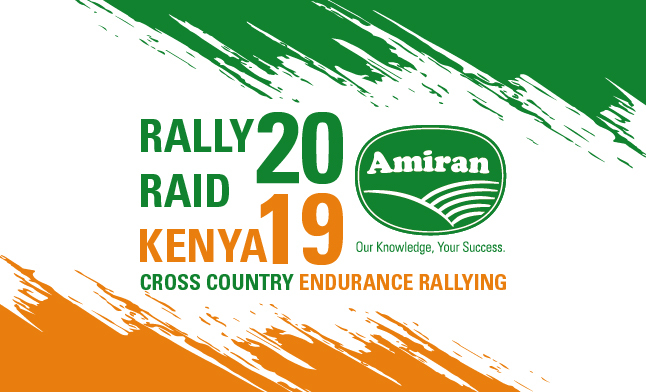 Amiran Kenya will use the diversity of Rally Raid Kenya to raise awareness within the emerging small-scale farming sector and, with a dedicated Social Responsibility Scheme, the partnership will see a positive impact in bothcommunity projects and conservation projects throughout 2019. The 2019 Amiran Kenyan National Rally Raid Championship kicks off with a Sikh Union organized event on 09 and 10 March. The two-day event will be based out of Ranch House Bistro on South Lake Road, Naivasha and will see competitors tackle almost 200 kilometres of grueling competition. The event will be especially designed to appeal to spectators and for those who miss the action there will be a dedicated highlights video launched on the Rally Raid Kenya YouTube channel a week after the event. The 2019 Amiran Kenyan National Rally Raid Championship will comprise of four events throughout the year and will see competitors visiting locations such as Baringo, Athi and Laikipia as they fight for overall and class honours. The championship, which regularly attracts more than thirty competitors, is open to bikes, quads, buggies and powerful off-road cars. New for 2019 is also a clubman class for those who are still learning the complicated art of navigation and this addition is expected to attract a number of new competitors. Amiran Kenya was founded in 1963 and has since become a pioneer in the Kenyan agriculture and floriculture scene. As well as providing support for small scale businesses throughout East and Central Africa. Amiran are at the forefront of new technology and play a major role in Kenya’s export flower and fresh produce industry through its irrigation and pest control programmes.